The fact is the that in most of these constituencies, the TRS lost elections despite increasing its vote share considerably. However most candidates fielded in these constituencies were from other parties and had secured double digit vote shares in 2014 too. 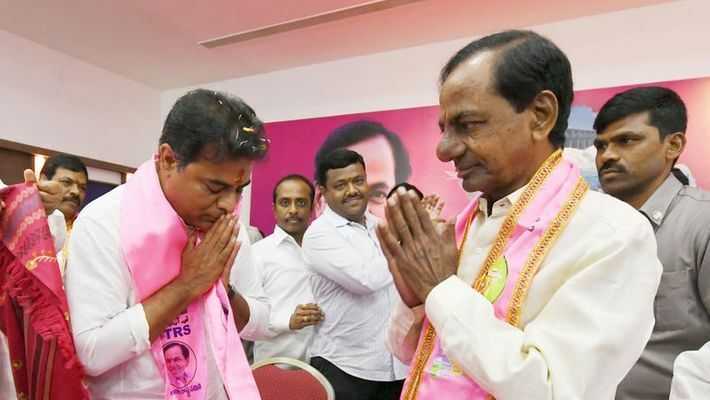 Hyderabad: The Telangana Rashtra Samithi won 88 seats in the December 7 assembly election and K Chandrashekar Rao has formed the government in Telanagana. Compared to last election, the vote share of the TRS has increased considerably and the confidence of the party leaders also has multiplied with this. The fact is the that in most of these constituencies, the TRS lost elections despite increasing its vote share considerably. However, a point to be noted here is that most of the candidates that gave the TRS an increase in vote share were from other parties and had secured double digit vote shares then too. The TRS selected them and fielded them from their party this election. Thus in fact, more than it being the achievement of the party, looks like these candidates brought the vote share to the TRS. Here are details of the TRS vote share in seven constituencies and how the TRS upped its vote share to double digits from 2014. TRS Candidate Adinarayana Jare secured 9.20% votes in 2014, the TRS fielded former Congress (sitting MLA) in Aswaraopet who secured 37.86% votes, but managed to secure second place after Mecha Nageswara Rao of the TDP who secured 48.21% votes. However, this is still an improvement for the TRS from 9.20% to 37.86%. In Bhardachalam constituency, the TRS candidate Mane Ramakrishna had secured 5.26% votes. But in 2018, the TRS candidate Tellam Venkata Rao secured 32.56% , but had to settle for second place against the Congress candidate Podem Veeraiah who secured 43.23% votes. Khammam constituency is situated just 121 km of Amaravathi, the capital of Andhra Pradesh. Thus, getting a good share of votes with the influence of Chandrababu Naidu's Telugu Desam Party (TDP) that is ruling in Andhra Pradesh is a commendable effort. In 2014, TRS candidate RJC Krishna had secured just 7.62% votes. But this election, the TRS candidate Ajay Kumar Puvvada secured 49.7% votes (1,02,760)- an increase of more than 40%. Puvvada had contested from Congress ticket in 2014 and secured 37.91% votes as he had emerged winner against RJC Krishna. In Kothagudem constituency, the TRS lost the election this time. But there was a considerable increase in the vote share of the party. The TRS candidate Venkat Rao secured 76,979 votes this time when compared to 50,688 votes in 2014. In Madhira constituency, there was a huge margin of difference as in 2014 the TRS candidate B Ramamurthy had got just 0.82% with 1,446 votes. This time party fielded L Kamal Raju who secured 77,031 votes that amounted to 41.21% vote share. However, Kamal Raju came second as Bhatti Vikramarka Mallu of the Congress secured 43.11% votes won the constituency. However, when compared to 2014 election, the TRS increased more than 40% of vote share in this constituency too. Pidamarthy Ravi of the TRS lost the election this time, he secured 40.87% votes when compared to 2014, when he had secured just 3.52% votes. Sandra Venkata Veeraiah of the TDP won the election with 50.62% votes. However, the TRS candidate's vote share increased more than ten times when compared to last elections. In Wyra constituency, Dr Banoth Chandravathi got 5.24% votes in 2014 to end up in fourth place. This time the TRS fielded sitting MLA, former YSRCP candidate Banoth Madanlal who secured 32.08% votes for the party in 2014. However, he too had to settle for second place as independent candidate Lavudya Ramulu secured 33.36% votes to claim the MLA seat for this term.